A major restoration and land reclamation project has become the most popular meeting place in the city. Kuching Waterfront epitomizes how this city has modernized without losing of its charm. Kuching is located on the Sarawak River chosen for its strategic and commercial importance and also for its enchanting natural beauty. 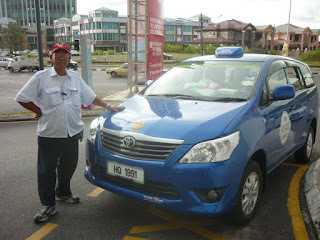 In those days Sarawak River was the city's main highway. The river still retains its picturesque charm in today modern era. A meander on the Kuching waterfront is a walk through time; from Kuching's humble, ancient origins, to a modern city. 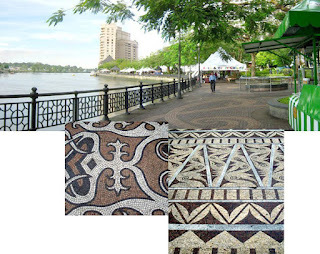 No visit to Kuching would be complete without a stroll on the modern esplanade, or to sit, relax and experience a Sarawakian sunset. 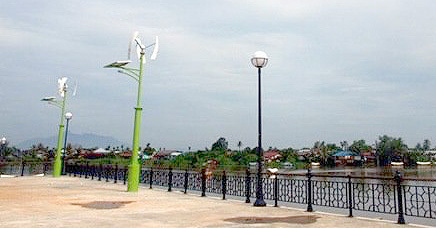 Kuching Waterfront, a major rest oration and land reclamation project, has become the most popular meeting place in the city. Drab warehouses have been replaced with 900m long esplanade of beautiful landscaped and dotted with wooden benches, food stalls restaurants and entertainment facilities. Local waterway taxis [tambangs] at left and right. White ship in the Middle is the MV "Equatorial", the Cruise ship that courses the river every day. 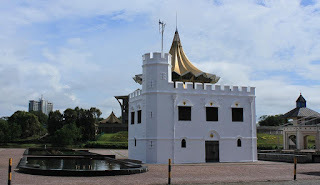 It is a leisurely way of glimpsing Kuching and it gives you a different perspective of the historic city. At night-time the waterfront comes alive. Rounding up the 4th Sunday of each month, the dancer groups will be strutting their multi-ethnic diversity of Sarawak at the Countdown Amphitheater Kuching Waterfront between 8:00pm - 9:00pm. The main routines will be focused on ethnic and traditional dances using their individual costumes accompanied by music and audience are encouraged to participate by joining in the dance. The busy weekly schedules to expose the artistic talents of Sarawak are part of the efforts to bring up a generation of artists and enhance the appreciation of local cultures and ethnic traditions. These will lead to better understanding of the arts and crafts, cultures of Malaysia locally and also among visitors. Oh really good information.. Nice blog dear..
Nice information.. good resources dear..
i am work this resources.. thaks.